被问到这个问题后，Ben Brode在推特上开玩笑道：那个确实是加拉克苏斯啦。艾瑞达领主的皮肤颜色会随着心情变化。那个时候是寒拉克苏斯。That's actually Jaraxxus. 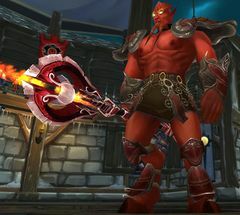 An Eredar Lord's skin changes color to match his mood. That's Chillaxxus.